Perhaps I should begin this post by admitting that it is ever so much easier to be a Lazy Raw Foodist than an Amish poseur/faery homesteader. Indeed, spiralizing, Vita-Mixing and dehydrating have nothing on canning when it comes to complexity and sheer multitasking brain power. Nonetheless, I’m having fun with it and thought I’d share some tips and mishaps that might either encourage and help others or maybe send them running for the nearest Whole Foods salad bar. Whichever. 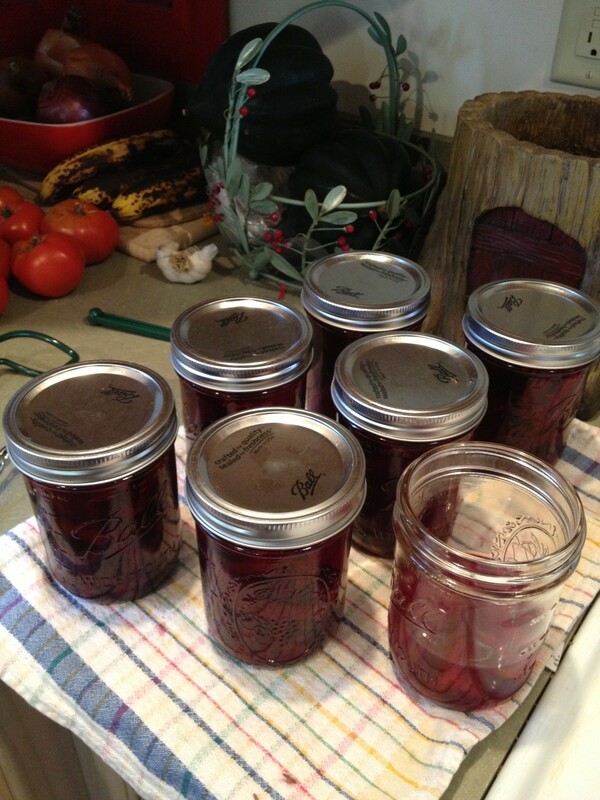 13) Recipes designed specifically for canning. Unlike raw food, canning is not forgiving of substitutions and changes to ingredient proportions. It’s chemistry, baby, and changing the acid balance could leave you with botulism, so express you’re inner rebel in some other food venue. Canning requires exactitude. 1) One or more silicon gloves for BBQ-ing, so that you can reach into the pot of boiling water without scalding your hand, as well as keep a good grip on the jar picker upper without getting scaled by steam as you lift the jar. Canning is bizarrely addicting in a pain in the elbow, completely overwhelm your kitchen and kill three hours kind of way. 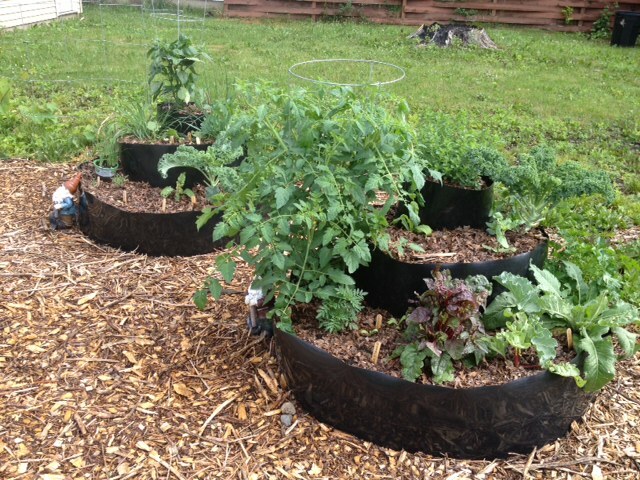 It also uses up bumper crops or cheap bulk purchases from the Farmers Market. In our house, it means being able to customize canned foods with foodie flavors and healthier ingredients than we’d ever find on store shelves. I’ve primarily used recipes from the book, “Put ‘Em Up,” as well as an online Jalapeño Jam recipe using Pomona Pectin, which allows you to sub birch sweetener, honey or other alternative sweeteners for the sugar, as well as lowering the amount of required sugars. Canning also makes for fun little gifts for friends and family — a way to share your garden harvest with people who can’t just pop over for some fresh tomatoes and kale. Did I mention multitasking? Get your brain on straight, and don’t even attempt canning if you’re tired, have brain fog, sore muscles or a lot of distractions. Certain parts of canning require uninterrupted concentration and perfect timing, so don’t be trying to answer the phone, make sandwiches and play on Facebook at the same time. David snuck this photo when I was concentrating so hard I didn’t even know he was standing there. You really do need to have a sense of humor, because sometimes a few details slip — like the time I heated up the lids but forgot to put water in that pot. Doh! 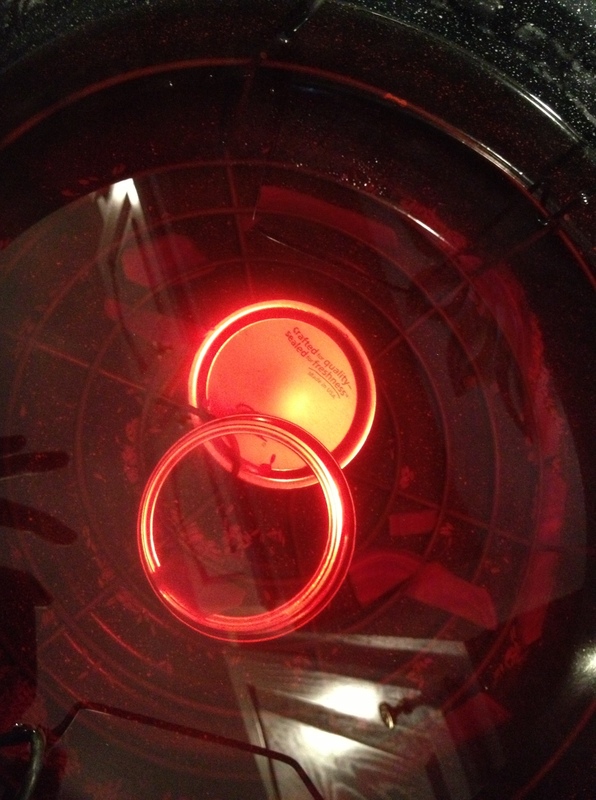 Can you say, “Burning plastic melted onto the metal pot?” We did. Toss any questionable lids. It’s a waste, but they won’t seal properly if you’ve mangled them or used them previously. The rings and jars can be reused, but not the lids. We get BPA-free lids from Ball. I’ve not canned that many times, but each time has brought some kind of unexpected (or several unexpected) things to deal with in the moment. We have very hard water here and use a water softener. All but our cold water faucet in the sink gets softened. One time, I forgot to fill the big canning pot with hot water, so not only did it take eons to heat, but all my jars had a lovely hard water mineral film on them after processing. David’s former home-ec teaching mom gave those jars the safety approval, but they look pretty grainy on the outside! When I made the jalapeño jam, I neglected to wear gloves while chopping fourteen incredibly hot peppers from our garden. I did wash my hands, but apparently, not enough, before putting them into the silicon gloves. 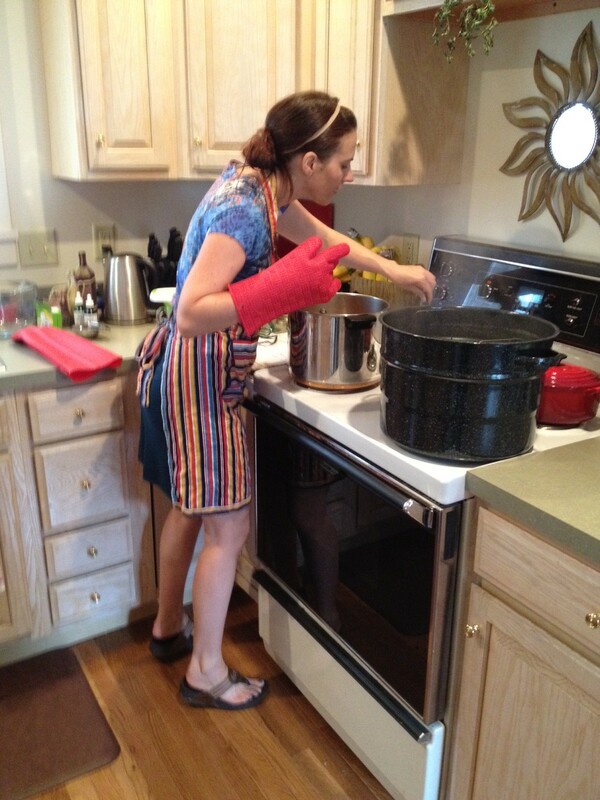 At first, I thought the gloves were leaking, because my hands just burned whenever I got near the canning pot. Then, I realized it might have something to do with the peppers, so I washed my hands again. And again. And again. They finally felt better, until I put the gloves back on — gloves that were now coated with jalapeño oil. To make matters worse, I had little paper cut-like slivers in both hands from wrestling with a tomato plant the day before. Let’s just say that by the time I finished canning that jam, I was actually hopping up and down in the kitchen and blowing on my hands to cool them. I tried vinegar, as recommended online, soap, cold water, aloe, MSM cream with peppermint oil. Nothing worked for more than about 45 seconds. In the end, those hands just burned for about 14 hours. The next time I put on the gloves as a test, the fun began again! Ohhhh, the fun. There’s nothing quite like having your hands burn so bad that you can barely move your fingers. I washed and washed out the silicon gloves, and I’m happy to report, they’re fine now. Sheesh, though! Potent lesson. Wear latex or some other kind of disposable gloves when you chop hot peppers, especially if you’re going to stick those hands in heat resistant gloves. Trust me when I say, “You will feel quadruple the heat of both the peppers and the hot water if you combine those experiences.” O.M.G.!!! Tomato salsa’s a bit tricky. You really need to lift those air bubbles out before putting on the lid. Otherwise, you’ll have a lava lamp looking salsa to wow your friends. Oh, yes, we do. Today’s canning really took things to a new level in terms of mishaps. I decided to make the pickled beets with cumin and cloves recipe from Put ‘Em Up. I boiled the beets until slightly tender, just like it said, chopped them into 1/4″ slices, just like it said, although not how the photo looked. Hmmm … Then I neglected to trust my intuition that told me a double recipe of that would fill 7 pint sized jars not 6 like it said. Sure enough, I got the six filled and had just enough beets to fill a 7th jar, which I heated and prepared like the rest. The trouble arose when I poured the brine over the beets. Um … I doubled the recipe for brine, but it only filled half my jars. Check, double-check, triple-check. OK … it’s the acid ratio that’s key, so I made another batch of the vinegar-birch sweetener-water-salt brine and poured it over the beets. That worked perfectly. Then, I sealed the jars lightly, also as recommended. You’re not supposed to strangle the lids with those rings, so I didn’t. 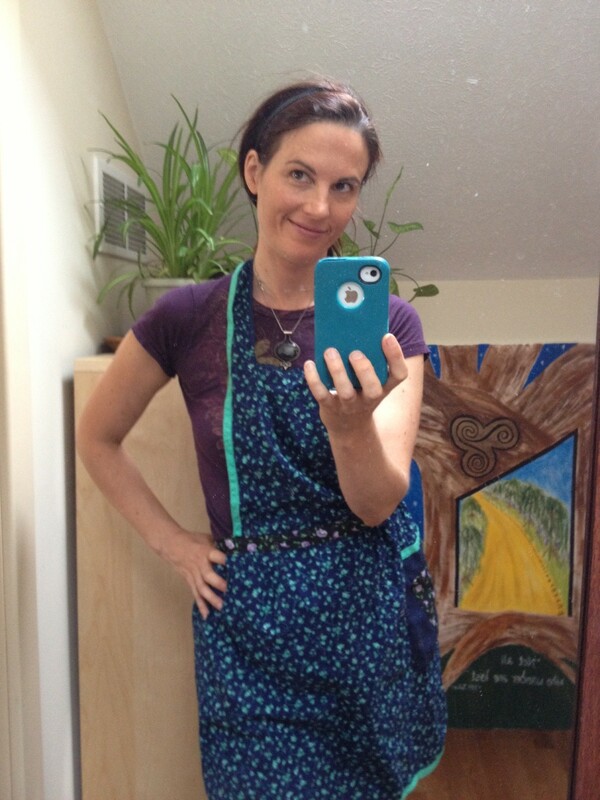 While texting with my sweet friend Tania Marie –who had just opened a goodies package I’d sent her earlier– I commented about how good our kitchen smelled while those jars were processing. (Once the jars are sealed, you really don’t smell what’s in them.) I also mentioned that my friend Tim Glenn had alerted me that Jupiter was exactly squaring my natal Uranus at 6 a.m. this morning. “Expect the unexpected,” he advised “… and don’t push it.” Those two lines of texting should have clued me in as I waited for the timer to count down on those jars, but no. I’m not sure how many people know this, but yesterday, Goshen, Indiana was right in line for the most severe weather predictions — another “derecho storm” with winds 58-100 mph, along with tornadoes, flooding and giant hail. I felt the energies all day, having been in a tornado in Kansas back in the mid-90’s. There’s a curious feeling that happens before tornadoes, something I have only felt a handful of times, always when tornadoes approached. In any case, I felt it yesterday, and when I saw the weather forecast, I got to praying and Rune-ing protection Runes around Goshen, our house, yard and David’s parents’ home. I also walked around the yard as the storm approached last night, harvested a bunch of greens, put pots of yet to be transplanted plants onto our enclosed front porch, and had a little chat with the Nature Spirits asking them to disband the storm as they’ve done in the past. (They’ve also been great at bringing strongly requested rain “out of nowhere” during a drought.) Anyway, I had some chats with the Guardians of our Land, put an energetic container on the giant pile of mulch by David’s car, and went inside. Well, all we got was a lot of rain (but no flooding) and some mild thunderstorms! It was like the derecho and tornadoes that had been making a beeline for us just evaporated. 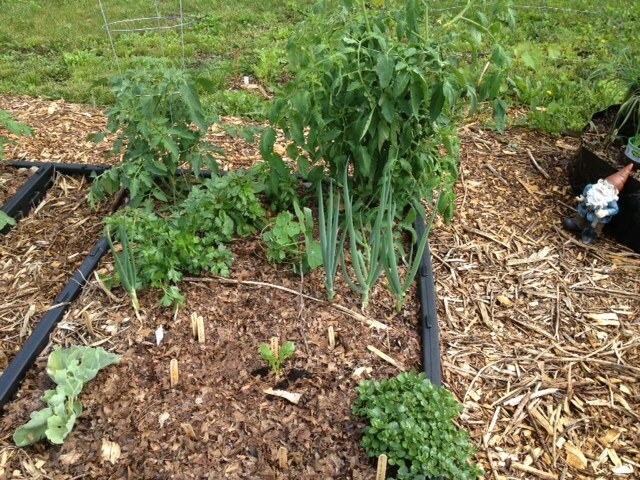 This morning, I looked outside, and the garden has grown exponentially overnight. 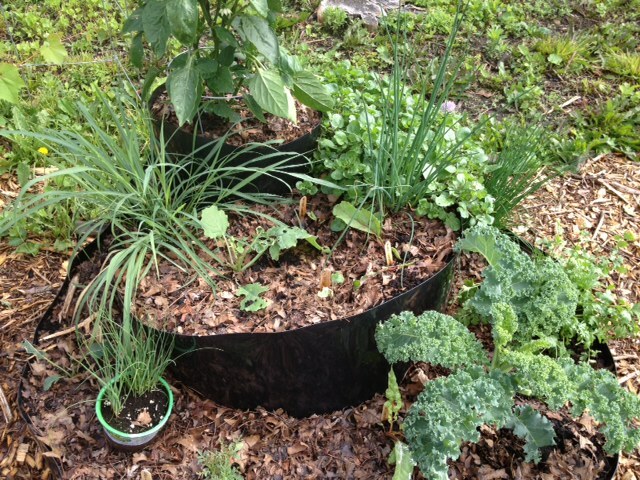 Between the compost, coffee grounds, Nature Spirit protection and all that rain, things are looking much happier. No additional slug damage, either. I also had a friend over yesterday who completely loved up our yard. That may have helped, since the garden does seem to grow extra well when someone comes in and expresses interest in all the Mad Scientist Gardening experiments. It’s like the plants puff themselves up with pride and want to perform even better. Today, I’ve got some other Transition Goshen folks coming over for a meeting and a peek at the wild abundance. 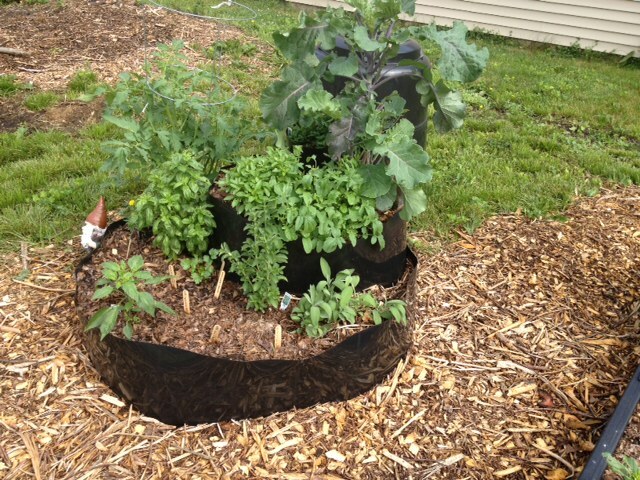 The “Bed Bed” with new chard, watercress, tomato, basils, onions and sea kale. 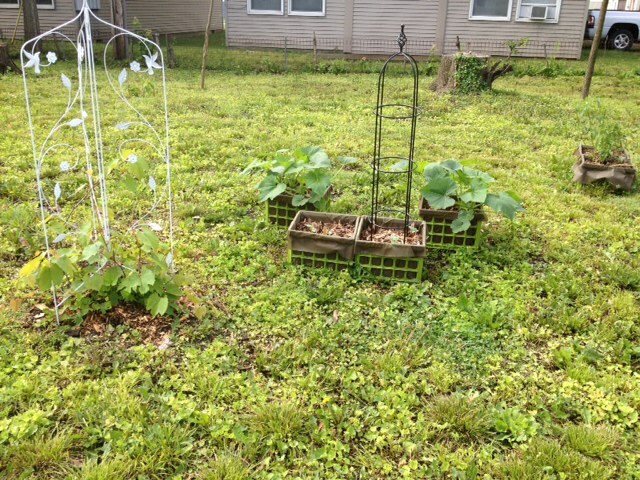 Just some of our squash, melons and cukes. We will be trellising those to make green walls in various parts of the yard. Also you can see grape vines to the left. In other parts of the yard, we’ve now got watermelon growing, Boston Marrow Squash, cantaloupe, lovage, and various spots of volunteer grapes. 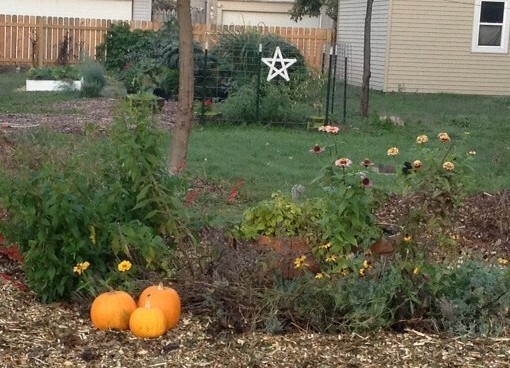 Things are coming along, and the daisies and coneflowers look ready to pop into exuberance any day now. Cheers and thanks! With all the news about Hurricane Sandy and the “never before seen” everything about it, I wanted to give my East Coast friends, family and clients some quick reminders that you don’t need to accept destruction into your home. Over the years, I’ve encouraged clients to surround their homes with white healing, protective light before a hurricane or tornado. These same people later told me that even when next door neighbors or the entire area of their town lost power or trees, they themselves did not. Others experienced minimal inconvenience, but no lasting power outages or major damage. In some cases, their homes looked like the only normal thing in a sea of disastrous debris. When I send up and call in protective energy around my own home, I try to include as much of the surrounding area as possible — without diluting the effects. You’ll need to sense that fine line between turning a specific, easily imaginable and felt intention into something abstract … then back down the abstraction until you can tangibly feel and imagine the safety, protection and healing again. If you don’t regularly practice energy work and you’ve got a HAARP-aggravated hurricane coming your way, I’d suggest you just focus on your own home this time. Don’t feel bad about protecting your immediate surroundings instead of everyone and everything you can think to include. It’s better to experience strong success in this method than only minor, random help to you and those around you. 1) Ask for a blessing on your family and home. This particular kind of prayer helps move you from default fear mode into a miracle-expectant mode. Just because The Weather Channel tells you something dreadful will occur, doesn’t mean you can’t look back on this experience as an amazing moment of Grace and deliverance. God/Spirit/Source/Divine Love/Angels … reveal themselves when our senses reach high alert. If you ask for a blessing, know that one or more blessings have already begun to make their way to you. Receive them. When the winds and rains kick up, recognize how much positive energy wants to shower you with good things right now. 2) Ask the Elementals for help. I wrote this past summer about how the Elementals responded with a much needed rain shower during our Wisconsin drought. If you follow that link, you can read a not-unique story. After sharing my experience with others, they let me know that they, too, had found rain when and only when they asked the Elementals to intercede on their behalf. Who are the Elementals? You can think of them as faeries, elves, Nature Spirits, devas … those who live ever so slightly beyond the veil but who share Gaia with us. Different beings connect more closely with different elements — Earth, Air, Fire,and Water. They can increase or decrease the energies associated with their preferred element. In the case of a hurricane, I’d get quiet and sincerely ask (even “just in your imagination” is fine!) the Water and Air Elementals to balance the hurricane energies. Ask the Earth Elementals to fortify the land. You can ask the Fire Elementals to mitigate the lightning and power outages. A fifth element, Spirit, runs throughout all creation, unifying it in Divine harmony. Connecting with Spirit and focusing on harmony will also ease any chaotic energies around you. As I explained in the article from this summer, the Elementals desire a closer working connection with humans interested in preserving and protecting our shared Earthly home. “Natural” disasters offer perfect opportunities to reconnect and realize that the whole is greater than the sum of its parts. No one but the psychopaths wants any kind of nuclear issues resulting from a hurricane or winter storm. The Elementals deeply love our planet, and they will absolutely work with sincere people looking to protect and love the land as well. 3) Ask for Angelic Protection. Angels will not interfere without your request, but they stand by ready to act whenever you ask. Archangel Michael, in particular, wields a fiery sword that can create an energy vortex of protection around you and your home. You can also imagine green, gold, pink, and/or white light covering your home and permeating every atom of your surroundings. Invite the angels into this light and know that they will hold and protect that space for you. This same technique works for healing in the event an illness or injury occurs, but why not preemptively ask for the love and light around you? “Love and Light” sound like New Age buzz words, but they’re extremely powerful forces in the Universe capable of transforming any and all energies coming your way. If you catch yourself becoming flippant with these concepts, take a moment to breathe in the fullness of what Love and Light encompass. A few rounds of that launch me deeper into my heart than I have ever comfortably remained — even though I do spend a lot of time in my heart. The words become a mantra and carry their own vibration, which seems to heal the angry spots inside. They also help to recognize even more of those Shadow Sides in which we have tangoed with the “Other” and hurt them and ourselves. In recognizing our own role in the victim/abuser/savior dance, we reclaim both our energy and our power. Those sticky relationships no longer tear at our inner peace like Velcro. 6) Remember any esoteric, natural or spiritual healing techniques you’ve learned. Studied Reiki years ago? No time like the present to dust off those skills! Learned about Quantum Healing or the Law of Attraction? Use this hurricane encounter as a quick refresher course. If you learned First Aid way back in the day, why not review some of those techniques? Do you have tons of Young Living essential oils lying around in a cupboard? Set aside some of the literature for entertaining yourself during the worst of the storm. You might especially want to have on hand those oils that calm fear or uplift the spirit. Whatever you’ve learned over the years, know that nothing is ever wasted. You have far more skills and resources at your disposal than you tend to use in everyday life. Why not reclaim these wonderful pieces of yourself? 7) Surround yourself with Sacred Symbols. For some people, the cross represents the most protective energy available. For others, the Thorn or Thurisaz Rune surrounds them with an energy shield associated with Thor, the Norse god of thunder and lightning. Celtic influenced people might prefer a five- or seven-pointed star, or the Triple Goddess Spiral. The symbol itself matters less than your association with the image. Symbols work directly on your subconscious mind, so having potent reminders nearby can help you feel and become stronger and more confident, regardless of what challenges you face. Advertisers, political campaigns and religions program your subconscious mind through symbols. By consciously selecting symbols that resonate with strength, excellence and power, you begin to embody those qualities and your reality reflects that shift. 8) Incorporate fun into your preparations. If you’ve got a family with young children or even just very scared adults, you can redirect any fear into positive energy by injecting a bit of fun into your lives. In addition to candles and blankets, take out some board games and novels. Hunker down and enjoy yourselves as much as you can. Finding ways to thrive in any and all circumstances actually alters those circumstances. Instead of worrying so much about power outages, find ways to rekindle your own inner power to create worlds. In a Universe of infinite possible realities, remember to include some fun!